Floral food is a combination of additives that help to nourish the flowers and discourage bacteria from growing in the water. It is one of the best, and easiest, ways to extend the life of your flowers. It is very important to follow the directions on the package correctly. Improperly mixed floral food can do more harm than good. 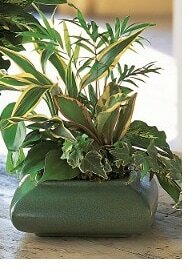 Your florist delivered plants and dish gardens are meant to be kept indoors and in moderate light. Avoid extended periods of direct sunlight. Regular watering (but not everyday) is essential. Insert index finger in soil to first knuckle and when the soil feels more dry than moist, it is time to water. Generally, this is every second or third day in an air conditioned environment.